TS ICET Final Seat Allotment Results 2018 College Wise: Students can download Telangana ICET Allotment Order released at tsicet.nic.in. Kakatiya University, Warangal successfully conducted Telangana Integrated Common Entrance Test (TSICET-2018). Candidates who had qualified in the examination appeared for the web based counselling, and waiting for the seat allotment results. 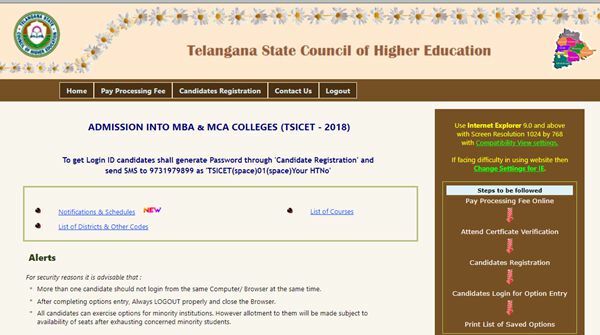 Telangana State Council of Higher Education has finally announced the TS ICET 2018 Seat allotment Results Released i.e; 31st July 2018. Candidates can check the results from the direct link provided below. The Qualified candidates of TS ICET-2018 desirous of seeking admission into MBA and MCA courses are attend for certificate verification at Help Line Centers (HLCs) as per the schedule given under. Based on the options excercised, seat allotment will be made as per merit rank and category (SC/ST/BC/PH/NCC/CAP/Sports and games quota etc ) of the candidate. The final Allotments will be placed on the Web on the scheduled date announced before hand and the Candidates will have to download the allotment order from the website. Final Phase Seat Allotment Released. Download Allotment Order by Signing-In through ‘Candidates Login’ from Below Link. The provisional allotment of seats will be made on 31-07-2018 and will be placed in the website https://tsicet.nic.in. For downloading the candidate’s provisional allotment order, enter the ROC Form Number, TSICET Hall Ticket Number, Password and Date of Birth in Candidate login in https://tsicet.nic.in . Pay the Tuition Fee mentioned in the Provisional allotment order through online (Credit Card / Debit Card/ Net Banking ) with in the prescribed time and self report through online system in candidates login and take admission number to confirm the provisionally allotted seat. Take the printout. The candidates with zero Tuition Fee mentioned on provisional allotment order shall perform the self reporting with in the prescribed time through online system in candidates login and take admission number to confirm the provisionally allotted seat. Take the printout. If the candidate cancels his / her admission will forfeit the Tuition Fee paid as mentioned below. i have got allotted seat in my first counselling but i didnt paid the online fees because i want to change my allotted college ? so as i didnt paid my amount am i elegible for the 2nd phase counseling? please do respond … as soon as possible….